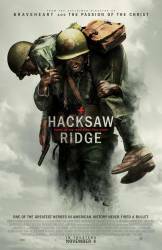 Factual error: Once the men first climb up to "Hacksaw Ridge," the camera pans over numerous corpses. One of them has an M1 Helmet lying on its top to where the liner is seen. The liner has the web suspension straps cross each other instead of being tied in the center. This means the liner is a Vietnam era type, and not World War II. Revealing mistake: When the stretcher is being lowered down on the line, the high tension steel wires can be seen under the hessian rope. Suggested correction: I don't see this as an error, because just before they lower him down; it is obvious that they have rigged a tripod and cable at a much lesser angle than straight down the face of the cliff. Once the cleanup phase started; additions like this would have been normal to remove the dead and wounded. I am 100% certain this is an error. The stretcher is seen lowered down hung from ropes tied at each corner, which would have really happened. Obviously this wouldn't meet safety requirements for filming, so they've "hidden" steel cables in the rope. The error is that the cables and the screw-in anchors in the stretcher are visible. Also the rope on some of the corners is visibly slack as a result. Prosecutor: There is only one question that any military court need ask of the accused: do you deny disobeying Col. Sangston's direct orders? Judge: Well, do you, Private? Desmond Doss: No, sir, I don't. Judge: Why are you contesting it, then? Why is it so important to you, given your refusal to even touch a weapon to serve in a combat unit? Desmond Doss: Because when the Japanese attacked Pearl Harbor, I took it personal. Everyone I knew was on fire to join up, including me. There were two men in my hometown declared 4-F unfit, they killed themselves cause they couldn't serve. Why, I had a job in a defense plant and I could've taken a deferment, but that ain't right. It isn't right that other men should fight and die, that I would just be sitting at home safe. I need to serve. I got the energy and the passion to serve as a medic, right in the middle with the other guys. No less danger, just... while everybody else is taking life, I'm going to be saving it. Captain Glover: All I saw was a skinny kid. I didn't know who you were. You've done more than any other man could've done in the service of his country. Now, I've never been more wrong about someone in my life, and I hope one day you can forgive me. Desmond Doss: With the world so set on tearing itself apart, it don't seem like such a bad thing to me to want to put a little bit of it back together. Question: In the first combat scene, we see the big climbing net already in place. Who put the net up in the first place and how would that have been done? And why would the Japanese not simply cut it down after the first fights when the US troops retreated? Chosen answer: US troops put the net up (in reality the ridge isn't as tall). The Japanese were fighting a defensive battle from heavily fortified positions on a reverse slope, and it suited them to have the Americans attacking from that point. The Americans also used ladders on other parts of the escarpment. Question: Why did the Japanese man at the end kill himself? Chosen answer: Japan's culture is complex and has a long history of ritual suicide ingrained within it. For Japanese, this practice was often expected of someone who had somehow failed, shamed, or otherwise dishonored themselves, their family, their country, and so on. Historically, suicide was also committed by servants after their master died, by Samurai widows, or when people were defeated by their enemies. At the end of WWII, many Japanese soldiers and civilians committed suicide rather than surrender. Question: Did drill sergeants typically fight with their platoons in WWII?